Welcome to Vocational Service Month! Here we are at the midpoint of a great Rotary year. 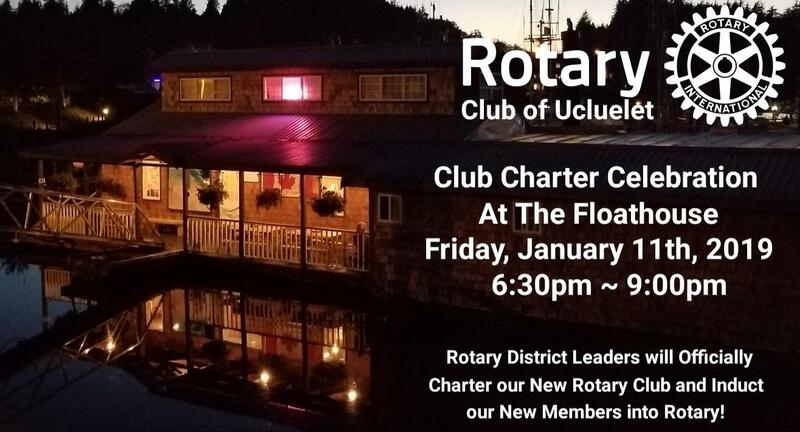 How exciting to be able to announce the chartering of a new Rotary Club in the community of Ucluelet. On January 11, we will welcome close to 40 new Rotarians to our District 5020 family. Registration for the District Training Assembly and District Conference is now open. This inspiring event hosted in Victoria May 9, 10, 11 promises riveting speakers, fun and fellowship, and much learning! Please consider sending a team from your club. Information is on the District 5020 website! January is also a time to revisit our progress on the goals we have set as clubs for our communities and the larger world. When we know where we are headed (or hope to be) our collaborative efforts can make such a difference. When our founders conceived of Rotary they envisioned bringing together members of a professional / vocational community who could support one another’s vision. Each time we introduce a new Rotarian to the ‘family of Rotary’ we increase our opportunity to serve others and be strengthened through our partnerships. The January 12 Membership Summit in Victoria is a great opportunity to share our membership wisdom focusing on Retention. Darwin Husa our District 5020 Vocational Services Chair …and his team….are working conscientiously to promote the importance of Vocational and Professional Service. At times Vocational Service hasn’t received as much focus and attention as it once did in the world of Rotary. Fortunately leaders like Darwin work diligently to raise our awareness of how to elevate Vocational Service in our District. Of note are the efforts of Corinne Gregory, a member of our district Vocational Service committee, who puts these ideals into action through her public speaking and her writing. Last year, Corinne released her book “Character Counts: Bringing the Rotary Four-Way Test to Life”. I include a few thoughts provided by the Vocational Service Committee……. Talk about your profession in your club, and take time to learn about fellow members’ occupations. Help young people achieve their career goals. Finally, as we remind ourselves of the origins of Rotary and the work we attempt to do as Rotarians, I ask you to again consider contributing to The Rotary Foundation. Your investment in our Annual Fund clearly makes a difference to our ability to access dollars that help to seed our district and global grants. Please consider Rotary Direct----contributing on a regular basis---at whatever level is acceptable to you. Your Club President, Club Foundation Chair, Assistant Governor, or Foundation Giving contacts (Lorna Curtis or Howard Svigals) are always pleased to answer any questions you might have. We are a ‘team’! Enjoy January----and thank you for your continued commitment to Rotary!